Can Cambodia’s Decimated Political Opposition Survive a Leadership Struggle? 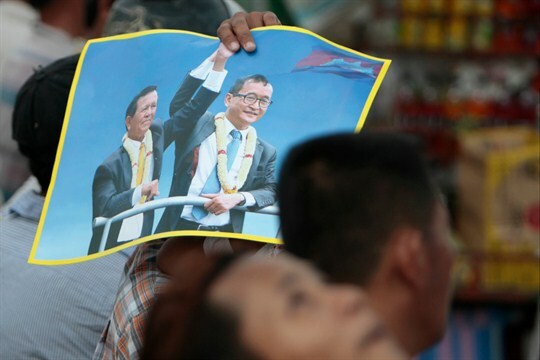 Supporters of the Cambodia National Rescue Party hold a poster of Sam Rainsy and Kem Sokha during the last day of campaigning for the June 4 commune elections, Phnom Penh, Cambodia, June 2, 2017 (AP photo by Heng Sinith). Factional divisions within the banned opposition Cambodia National Rescue Party, or CNRP, came to the surface in December, when a party conference in Atlanta named exiled opposition leader Sam Rainsy its acting president. The conference was boycotted and its outcome rejected by supporters of Kem Sokha, the CNRP’s erstwhile president who remains under house arrest in Cambodia pending trial on charges of treason. In an email interview with WPR, Astrid Norén-Nilsson, associate senior lecturer at the Center for East and South-East Asian Studies at Lund University, Sweden, discusses the origins of the CNRP leadership dispute, and the implications of the opposition’s internal divisions for Cambodian politics.